Whatever Happened to Conservative Social Thought? « Might Campus Free Speech Laws Muzzle Some Speech? Conservative thought hasn’t always been absent in campus social science circles. 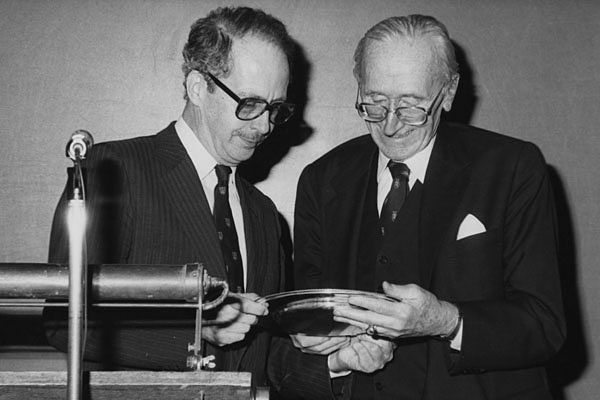 Here, Ralf Dahrendorf, left, presents F. A Hayek with a commemorative plate in 1981 on the golden jubilee of Hayek’s first lecture at the London School of Economics. I have not written about Brexit in this blog space mainly out of courtesy to its international readership. I am not going to do so now, except to note that this is not entirely a private British grief. The Brexit debates have revealed a degree of intellectual bankruptcy that has implications well beyond the contested borders of the United Kingdom. This speaks as much to a failure on the part of the social sciences to provide a broad grounding in political thought as to the failure of politicians to articulate a coherent rationale for their actions. This post focusses mainly on conservative thinking, partly because it is increasingly difficult to identify when and where many students would meet a respectful presentation of this stream of ideas. How many social science departments actually teach a core component on Conservative Social Thought? Conservative social and political thought rests on three quite distinct foundations that many contemporary politicians would struggle to disentangle – which is partly why their policy prescriptions are such a mess. However, the failure of the social sciences to define and articulate these also poses a problem for critical analysis. If we fail to recognize the genuine legitimacy of alternative formulations of key theoretical issues in our field, we will struggle to do more than chant slogans in response. 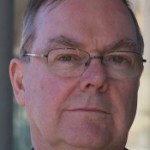 I have long thought, for example, that the best account of libertarian thinking was Andrew Gamble’s book on Hayek: although Gamble is probably the leading Marxist political theorist of his generation, his engagement with its main contemporary opponent is a model of exposition that recognizes the relevance of Hayek’s critique of social planning to any model of socialism. If libertarianism is one stream of latter-day conservative thought, what are the others? One would be the tradition of Burke and Oakeshott, recognizing the need for those who have benefitted from the existence of an ordered society to act responsibly on behalf of those who have not. This encourages modest reform to meet recognized social problems and promote stability and security. Wealth is not protected by law enforcement but by social inclusion: as the late 19th century British Conservative, AJ Balfour, said: social legislation is the “direct opposite and most effective antidote to socialist legislation… the adoption of what is good [in socialism] is the best preventative for what is bad”. Many social scientists may feel uncomfortable with thinking about the duties and responsibilities of the better-off rather than the rights of the poor or socially excluded. However, this framing deals with an issue that many ordinary citizens feel uncomfortable with, namely the socializing of private property and interpersonal relations. Should these be a matter of individual choice or collective constraint? What, they ask, is wrong with wanting to retain the bulk of the wealth and property acquired through one’s own efforts – or at least to redistribute it in accord with one’s own preferences rather than some communal ranking of priorities? More controversially, a third stream is what we might call ‘blood and soil nationalism’, which goes back ultimately to some rather unsavoury 19th and 20th century writers who are usually considered only as theorists of racism or fascism. There may be all sorts of reasons to dislike the conclusions drawn from this tradition – but it deserves study as an alternative critique of industrial capitalism and its social consequences and as an articulation of a neglected dimension of identity politics. If everyone else has an identity claim with associated rights, why would we exclude white people? Are we better able to find a resolution to conflicts over identity rights if we accept that “mainstream” groups also have claims to respect? Does it help if trans activists, for example, simply dismiss the concerns of cis men and women about the competing claims on traditionally gendered spaces? Both Brexit and Trumpist politics have been driven by myths about national exceptionalism that have been ignored rather than discussed. The real Brexit voter is not the unemployed rustbelt worker but the bourgeois in comfortable retirement, who has fed off a version of WWII in comic books and movies that has little relation to reality. The economic basis of that comfortable retirement remains invisible to its beneficiaries, although it would soon be exposed by the economic disruption and currency collapse that would go with Brexit. However, when did the social sciences last have a serious engagement with the institutions of the bourgeoisie, even though by income and status many of us would belong to that class? A leading UK scholar of working class communities was recently celebrating a new appointment that would allow her to live among them again. Should we have been more impressed by a position that would enable her to have middle-class retirees as her neighbours? These concerns matter because they go to the core of what we are here for. Are the social sciences an intellectual wing of some radical movement, whether of the right, as in the case of economics, or the left, as in the case of most others? Or are they a means of informing the practice of those who represent and lead major social institutions? Do we work hard enough to get partisans to appreciate the complexity of politics and society – and the genuine concerns and arguments of their critics? Do our libertarians understand why Adam Smith thought markets should be constrained by moral sentiments? Do our advocates for the marginalized understand how and where this threatens the identity of those whose consent is required for lasting change? This entry was posted in Brexit, Higher Education Reform, International Debate and tagged conservatism, Conservative Social Thought, Friedrich Hayek. Bookmark the permalink. Trackbacks are closed, but you can post a comment.